James, J.O., Svihla, V., Qiu, C., & Datye, A.D. (7/2018). A New Facet: Building Multifaceted Engineering Identity. In J. Kay & R. Luckin (Eds.). Rethinking learning in the digital age: Making the Learning Sciences count. ISLS. Kang, P.S. & Svihla, V., (10/2018). An Iterative Approach to Kotter’s Change Model: A Case of Successful System Change in Higher Education. Proceedings of the AECT Annual Meeting, Kansas City, MO. Svihla, V., Gomez, J.R., Chi, E., Kang, S.P., Miletic, M., Hubka, C., Chen, Y., Han, S.M., & Datye, A. (3/2019). Revolutionizing Engineering Education by Building on Students' Engineering Assets. Proceedings of the ASEE Gulf Southwest Regional Conference, Tyler, TX. Gomez, J.R. & Svihla, V. (4/2018). Rurality as an asset for inclusive teaching in chemical engineering. Chemical Engineering Education. 52(2). http://journals.fcla.edu/cee/article/view/105855. Svihla, V., Gomez, J.R., Bowers, S., James, J., Prescott, P., & Datye, A. (7/2017) Asset-based design projects in a freshman level course. Proceedings of the ASEE 124th Annual Conference and Exhibition. https://peer.asee.org/27645. Gomez, J.R., Svihla, V., & Datye, A. (7/2017). Jigsaws & Parleys: Strategies for engaging sophomore level students as a learning community. Proceedings of the ASEE 124th Annual Conference and Exhibition. https://peer.asee.org/28597. Our 2016 ASEE paper was selected from 1700 submissions as the Best Diversity Paper. As a result, we were asked to present our paper in a special session focused on diversity at the ASEE 2016 meeting, and PI Svihla presented this work at the plenary session at the national ASEE meeting in 2017: Svihla, V., Gomez, J.R., Datye, A., Law, V., & Bowers, S. (7/2017). Plenary talk: Best 2016 Diversity Paper: Mapping assets of diverse groups for chemical engineering design problem framing ability, ASEE 124th Annual Conference and Exhibition, Columbus, OH. https://www.dropbox.com/s/6562yrbzyldw6w1/Svihla%20Plenary%20ASEE%202017.mp4?dl=0. Gomez, J.R., Svihla, V., Datye, A., Law, V., & Bowers, S. (11/2017). Design challenge parleys as a conduit for growing student expert thinking in the classroom. Paper presented at the 2017 AIChE Annual Conference, Minneapolis, MN. https://www.aiche.org/conferences/aiche-annual-meeting/2017/proceeding/paper/309b-design-challenge-parleys-conduit-growing-student-expert-thinking-classroom. Svihla, V., Miletic, M., Gomez, J.R., Datye, A., Chi, E. (10/2017). 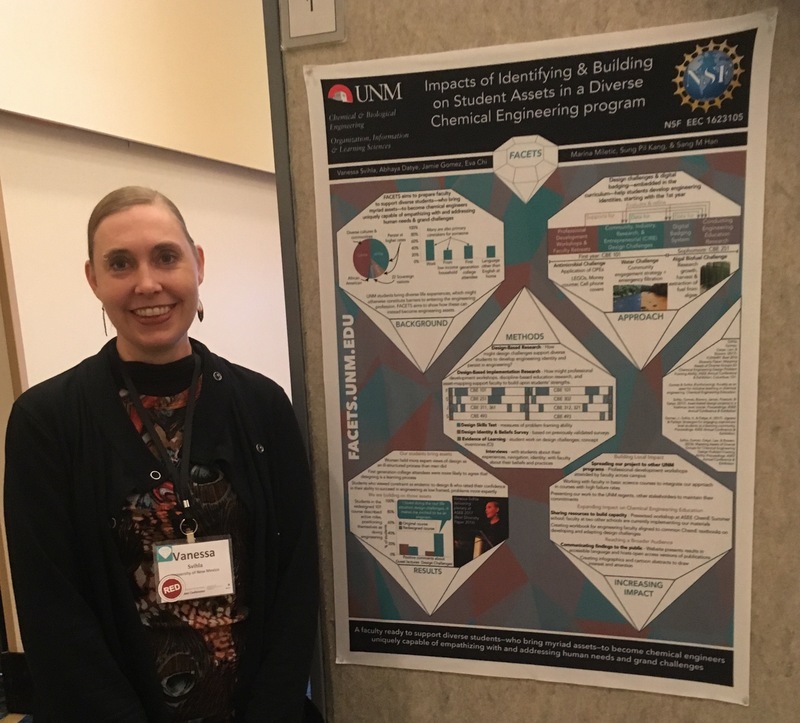 Impacts of identifying and building on student assets in a diverse chemical engineering program. Paper presented at the 2017 NSF EEC Grantees Conference, Arlington, VA.
Gomez, J.R., Svihla, V., & Datye, A. (7/2017). Jigsaws & Parleys: Strategies for engaging sophomore level students as a learning community. Paper presented at the ASEE 124th Annual Conference and Exhibition, Columbus OH. Svihla, V., Gomez, J.R., Bowers, S., James, J., Prescott, P., & Datye, A. (7/2017) Asset-based design projects in a freshman level course. Paper presented at the ASEE 124th Annual Conference and Exhibition, Columbus OH. James, J.O., Svihla, V., Qiu, C., & Datye, A.D. (7/2018). A New Facet: Building Multifaceted Engineering Identity. Paper presented at the 2018 International Conference of the Learning Sciences, London, UK. Lenz, K., Ista, L.K., Svihla, V., Kang, P., Chi, E., & Canavan, H.E. (7/2018). Work in Progress: Biomedical prototype design in collaborative teams to increase students’ comprehension and engagement. Paper presented at the ASEE 125th Annual Conference and Exhibition, Salt Lake City, UT. Hubka, C., Chi, E.Y., & Svihla, V. (7/2018). Peer review and reflection in engineering labs: Writing to learn and learning to write. Paper presented at the ASEE 125th Annual Conference and Exhibition, Salt Lake City, UT. Gomez, J.R. & Svihla, V., (7/2018). Supporting Diversity in Teams Through Asset Mapping. Paper presented at the ASEE 125th Annual Conference and Exhibition, Salt Lake City, UT. James, J.O., Svihla, V., Qiu, C. & Datye, A.D., (7/2018). Using Design Challenges to Develop Empathy in First-year courses. Paper presented at the ASEE 125th Annual Conference and Exhibition, Salt Lake City, UT. Svihla, V., Gomez, J.R., Datye, A., Chi, E., Miletic, M., Han, S.M., Kang, S.P. (4/2018). Using students’ engineering assets to drive professional identity formation and faculty change. Paper presented at the AERA Annual Meeting, New York, NY. Hubka, C., Chi, E., & Svihla, V., (7/2018). Peer review and reflection in engineering labs: Writing to learn and learning to write. Proceedings of the ASEE 125th Annual Conference and Exhibition. Gomez, J.R. & Svihla, V., (7/2018). Supporting Diversity in Teams Through Asset Mapping. Proceedings of the ASEE 125th Annual Conference and Exhibition. James, J.O., Svihla, V., Qiu, C. & Datye, A.D., (7/2018). Using Design Challenges to Develop Empathy in First-year courses. Proceedings of the ASEE 125th Annual Conference and Exhibition. Lenz, K., Ista, L. K., Svihla, V., Chi, E. Y., & Canavan, H. E. (7/2018). Work in Progress: Biomedical prototype design in collaborative teams to increase students' comprehension and engagement. Proceedings of the ASEE 125th Annual Conference and Exhibition.